Cienki, A., Bietti, L & Kok, K. (2014). Multimodal alignment during collaborative remembering. 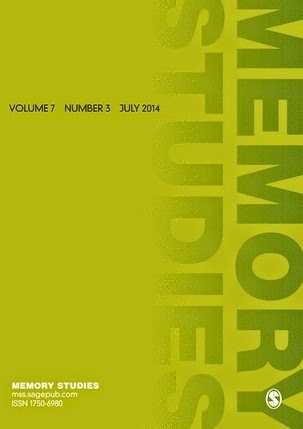 Memory Studies, 7 (3), 354-369. Abstract: This article investigates the roles that interactive alignment of manual gesture, postural sway, and eye-gaze play in small groups engaged in collaborative remembering. Qualitative analyses of a video corpus demonstrate that the coordination of these behaviors may contribute to joint remembering in various ways, depending upon the cognitive and communicative affordances of these behaviors. The observation that these behaviors are different in their nature and their contributory potential to shared remembering is corroborated by the results of a quantitative analysis, which suggests that co-speech gesture, postural sway, and eye-gaze have different interactional dynamics. This supports the conclusion that in order to understand the role of multimodal alignment in the discourse of shared remembering, co-verbal behavior should not be treated as a homogeneous category. Finally, we discuss the potential of combined qualitative–quantitative approaches to inform the interplay of verbal and bodily coordination during interactive memory construction.